Amazon’s website is, in the west, the dominant platform for online retail sales…. This is bad for democracy. Commerce ought to reside in markets governed by regulations set by democratic political process not those chosen by the world’s richest man, Amazon’s founder Jeff Bezos. My view is that Mr Bezos, together with Bill Gates and various other people whose names it will be briefer to let my readers guess than for me to enumerate, is one of the greatest men alive. He has increased the wealth and happiness of countless millions. He is helping to bring into being a world that, just one generation ago, the boldest science fiction writers were cautious to describe. He has earned every penny of his great fortune. According to an investigation from Britain’s Mirror and Sun newspapers, employees at Amazon fulfillment centers [sic] in the United Kingdom routinely fall asleep on the job because of the backbreaking workload. Fifty-five percent of employees said they were criticized for taking sick days. Some female workers even claimedthey were penalized for taking time off during pregnancies. Amazon disputes these claims. However, I know people who work in this sector, and I do not find the claims unlikely. My response is that these working conditions are the fault of the British State, not of Amazon. Let us imagine a natural order—that is, a world without states, or at least a world without the extended patterns of state-intervention that now exists. In such a world, wage labour would continue to exist. There are benefits in working for someone else. An employee commits to a contract of permanent service, in return for which he receives reasonable certainty of payment. Not everyone is or wants to be an entrepreneur. Not everyone finds it suitable to keep looking for unsatisfied wants and the most rewarding means of satisfying those wants. This being said, there would probably be much less wage labour than there is now. If the present order of things does little to deter men like Mr Bezos, it does much to deter little people from starting little businesses – little business that sometimes replace, but more often supplement employed income. When I was much younger, the easiest way I found of making extra money was to drive a mini-cab. I went to the nearest cabbing office. I showed my clean driving licence. I showed a certificate of hire and reward insurance. I handed over £25 rent for the week, and was given a two-way radio and a cabbing number. That evening, I was taking prostitutes to their clients and pushing drunks up their garden paths. You cannot do this nowadays. Cabbing is licensed and regulated. It costs thousands to get a licence, and the regulations about age and type of vehicle add tens of thousands more to the costs of entry. You cannot get into cabbing unless you can pay these entry costs, and unless you are able to pay them back by working there full-time and long-term. A casual business has been made into a profession. This is an example of which I have personal knowledge. But there is a vast range of little businesses that bring some money to little people. They have nearly all been placed out of reach. The effect is to increase the supply of unskilled labour seeking employment. Think of a supply and demand diagram. Shift the supply curve to the right. Make it more elastic. Money wages will be lower than they would otherwise be. Conditions of work—and these are part of the overall wage—will be worse. Make laws to prevent the market from operating, and there will be more unemployment. A further point I mention without choosing to develop is mass-immigration. This is not the kind of movement you would see in a natural order, where virtually the whole cost of entry and adjustment fell on the individual entrant. It is a movement encouraged and subsidised by the State—encouraged by institutional political correctness, and subsidised by laws that amount to forced association. 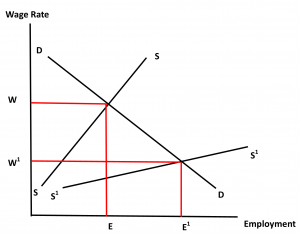 The effect in economic terms is again on the supply curve for labour. I have no reason to believe that Mr Bezos and Amazon have done anything to bring about this state of affairs. They simply operate in the labour market as they find it. No one is forced to work for Amazon. Amazon is not a legal monopoly, and has no power to force down wages. It pays at least the going rate. It is not a charity, and cannot be expected to behave as a charity. Blaming Amazon for how it pays and treats its workers makes no more sense than blaming a clock for telling the time. I turn to the objection that Amazon is a limited liability company. This is an objection I accept. Limited liability companies exist because of a grant of privilege by the State. They are treated as persons, responsible for their own debts. Their owners have no liability beyond the value of the shares they own. This grant allows companies to gain more investment capital than they otherwise might. It allows them to grow larger and to exist for longer than they otherwise might. It allows even the most entrepreneurial company to turn gradually into a private bureaucracy, trading favours with the various state bureaucracies. Limited liability turns business into the economic arm of a malign ruling class. So far as Amazon benefits from limited liability, it is an illegitimate enterprise. But this is not the end of the matter. 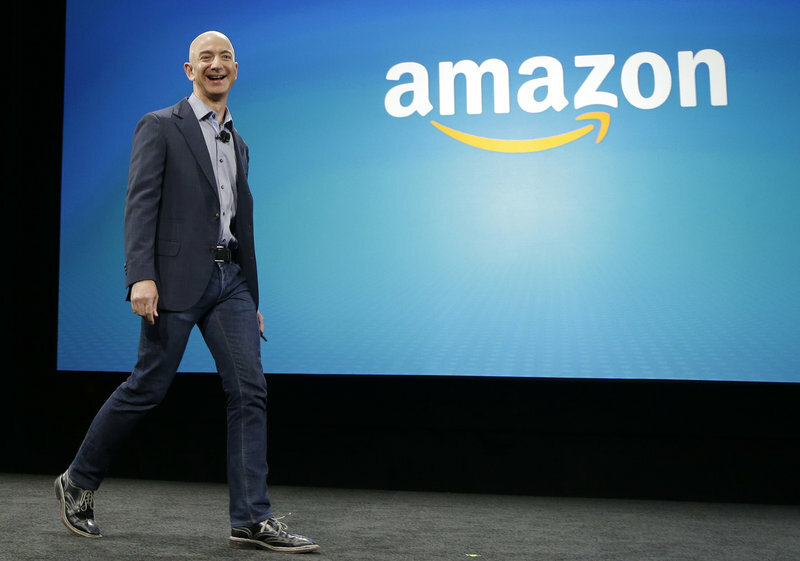 Amazon almost certainly could exist without limited liability. It would instead have raised its investment capital by selling bonds. It would then only be in form what it plainly is in substance—that is, a projection of its owner’s ambition to achieve greatness. It would still have grown large, and it would have grown large by giving its customers what they want. Here, I will say what I want and what I get from Amazon. I buy books and I sell books. I sell second-hand books, and I sell my own books. In 1983, I was hard up, but decided I wanted my own copy of David Hume’s Enquiry Concerning Human Understanding. One hot Sunday morning, I cycled from Catford to the top of Hampstead Hill, where I had read there would a book fair. No Hume. I then cycled to the market at Camden Lock. After much rummaging, I found a nice edition of what I wanted. I got home as the sun was setting. I thought I had been lucky. I was lucky. I might have searched for weeks. In 2016, I decided I wanted a copy of Leon Garfield’s Smith. I searched for ten minutes on Amazon. I found a cheap hardback. It arrived the next day. No one forced me to do business with Amazon. I could have used Abe Books or E-Bay. I could have searched through the charity shops in Deal, Dover and Ramsgate. I could have gone to Canterbury. Instead, I used Amazon, and I was delighted with the service that it variously provided and mediated. Or let me talk about the production and sale of my own books. I will ignore the books that are handled by mainstream publishers like Hodder & Stoughton, and focus on the books I publish myself. When I started writing in the 1980s, you can be sure that no mainstream publisher would touch me. I went round every printer I could find to gather quotes. The average quote, as I recall, was about £2,500—worth somewhat more in those days than it is now. This included typesetting and a thousand copies. Unless I wanted to spend the rest of my life taking boxes to conferences, there was no chance of distribution. No bookshop would have handled my product. I was lucky. First, I gave up on self-publication. Second, the printers I contacted were reasonably straight. This was the age of the vanity press. I could have parted with £5,000, and got in return a dozen crates of wire-bound toilet paper. Two months ago, I had the idea of producing a set of extracts from the Latin New Testament of St Jerome, together with an Introduction, Notes and a Complete Vocabulary. I put this together in Word for Windows. I designed the cover in Microsoft Publisher. I uploaded the result to Amazon KDP. This gave me a free ISBN. I had the book live on the Amazon site within a day, where it became permanently available for a tenth of the human race to buy. When I found inevitable typos in the text, I had the revisions live within six hours. The book impressed my students and other clients. It has been put on university reading lists in England and America. I can buy as many author copies as I order, all at £1.73 a go. For sale copies, Amazon pays me a royalty of 60 per cent, excluding cost of printing. The book has sold nearly three hundred copies in the past month. I had already published more than a dozen other books through Amazon. Some of these have sold rather well. One has sold five copies in four years. They all look just like “real” books. They are “real” books. My latest book through Amazon was my daughter’s first novel. I brought this out the other day. It may or may not make her rich. It is certainly something she can show round at school. Show me the unfair dealing in any of this. Everything has been by informed mutual consent. Either party at any time could walk away and do business somewhere else. In all our dealings, Mr Bezos and Amazon have been committing acts of nearly spotlessly clean capitalism. So much where I am concerned, and so much were everyone else is concerned. If Amazon has become the biggest sales platform in the world, it is because we the people have elected it to that position. If it loses its first place, it will be because we the people have found something even better. Mr Bezos has earned every penny of his fortune. He has earned his fortune on the moral grounds that he has acquired it by full consent. He also deserves it on utilitarian grounds. When he began Amazon in 1995, the Internet was a graveyard of failed ventures. Everyone agreed there was money to be made. Almost no one was able to make it. Mr Bezos poured his life into a vision that might also have come to nothing. Entrepreneurship, as said, is about finding unsatisfied and usually unknown wants, and then finding the most effective means to satisfy them. Most entrepreneurial guesses are mistakes—stainless steel cars, video disks, digital radio broadcasting, touchscreen personal computers. On the whole, big risks are taken where there is a chance of big rewards. Make laws of whatever kind that abolish big rewards, and there will be fewer big risks taken. Mr Bezos has earned every penny of his great fortune. Now, I have spoken about clean capitalism. Amazon is pretty clean. So is Microsoft. So, in spite of its caving in to the censorship lobby, is Facebook. So, with reservations, is Tesco and Sainsbury and most other organisations with which I do business. But the world in general, and England in particular, is filled with examples of dirty capitalism. Take this as an example. Last month, I paid a water bill of £314.17. That was for the first six months of the year. I expect another bill before Christmas for roughly the same amount. According to my records, I paid £175 for the whole of 2008. In 1988, I paid just over £70. If you look on any website of the privatised water companies, you will see a mass of self-congratulatory wording about improvements in the quality of supply, and about how satisfied the customers are. Well, if you measure quality by the colour of the water that comes out of the tap, and satisfaction by the risk of dysentery, I suppose I have nothing to complain about. Then again, I had nothing to complain about in the 1980s, or in any of the other decades I have lived through. What I do complain about is the price. According to The Guardian—not always an unreliable source—the basic salary of the Chief Executive of South West Water rose from £260,000 in 2003 to £539,000 in 2012. In 2017, the total salary of the Chief Executive of Severn Trent was £2.45 million. In 1981, the Chairman of a Regional Water Board was paid between £26,000 and £33,000. Using a Retail Price Index calculator, we see that £30,000 in January 1981 is now worth £117,237. The work of a Chief Executive is unlikely to have changed much in the past 37 years. In 1981, the water boards were regional monopolies owned by the British State. They are now regional monopolies owned by mostly corporate shareholders or foreign governments. Competition is out of the question. Innovation is optional. Entrepreneurship is a word. If we look at the salaries of other senior managers in the water sector, we probably see the same inflation. Indeed, the number of senior managers is likely to have risen considerably, bearing in mind the proliferation in every sector of human resources management, climate change managers, and equal opportunities management. [t]he nine English regional water and sewerage companies—three of which are listed on the stock market and six of which are owned privately—have invested no significant new shareholder equity but extracted nearly all of their post-tax profit as dividends…. At the same time, the companies have built up a growing pile of debt to finance investments over the 28 years since the industry was privatised. According to the same newspaper article, the Government kept the debts of these companies when they were privatised—debts of £4.9bn in 1989 money, and it gave them £1.5bn. Compare this with the £7.6bn for which they were sold. These facts being so, I feel decidedly ripped-off. My water bills have gone through the roof to pay inflated salaries to executives who are no more part of a genuinely private sector than the elected members of the Deal Town Council; and to generate dividends for more of the usual corporate bureaucrats; and to put money in the pockets of an army of lesser special interests. I have nothing against privatisation. The less a state does, the better. By 1980, the British State was making steel and cars, and digging coal, and managing the telephone network and all the other old “commanding heights of the economy.” It was doing this rather badly. I see no good objection to having the State stand back and let these things be done or provided via the market. Leaving aside my objection to limited liability companies, I approve of the sale of British Telecom and British Petroleum and other organisations of their kind, and leaving them to compete on a level playing field with other companies. What I do object to is the transfer of monopolies from state to private hands. In this case, the Government was not privatising in any meaningful sense. The effective result of its actions was a combination of tax-farming and the sale of offices. We the people are the victims of this state of affairs. We are exploited. If “vulgar libertarianism” is the celebration of privilege as if it were the outcome of free association, I am not a vulgar libertarian. But neither am I a left-libertarian, or any kind of socialist. Show me an example of successful and reasonably clean capitalism, and I will turn very Ayn Randy. Where Jeff Bezos is concerned, he has earned every penny of his great fortune. Note: Every book link in this essay is an Amazon affiliate link. If you buy any of these books—if you go to Amazon viaone of the links, and buy anything else—I shall earn a small commission. You pay nothing. Whatever you buy is the same price as usual. My commission is part of Amazon’s operating cost. You will have your work cut out if you try arguing that Amazon’s business model is in any sense less than moral!